Mammalian target of rapamycin (mTOR), a serine/threonine kinase also known as FKBP12-rapamycin-associated protein (FRAP), is a master regulator of protein biosynthesis, cell growth and autophagy. 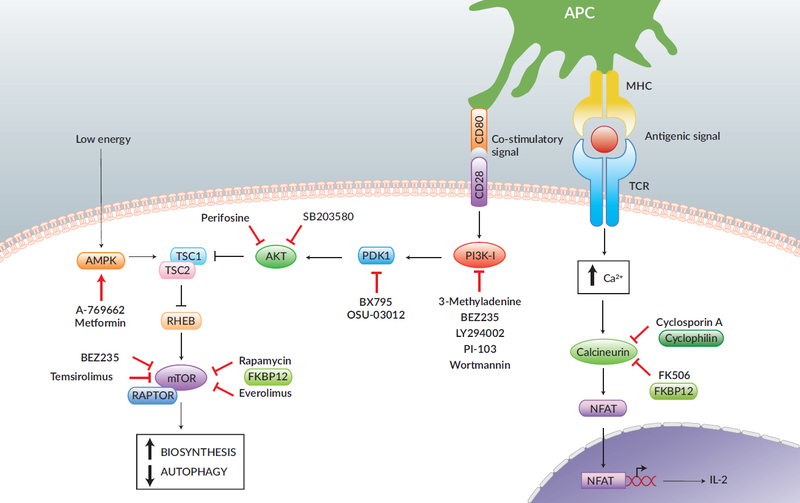 mTOR is implicated in many disease states and is a target for the design of anticancer agents. Calcineurin signaling is involved in the activation of T cells. Calcineurin is a Ca2+ and calmodulin dependent serine/threonine phosphatase that activates the NFAT transcription factor, which stimulates the T cell response through IL-2 expression. InvivoGen provides inhibitors that block mTOR activation and signaling by Calcineurin.